Varicose Veins - A Problem for Men Too. Home » Articles about our Treatments » Varicose Veins – A Problem for Men Too. Varicose Veins – A Problem for Men Too. Guys, have you noticed those unsightly blue lines on your thighs and wondered what they are? They might be varicose veins. It’s common for women to talk about issues with their bodies but society has taught us that men aren’t meant to do the same. We’re here to tell you that this simply isn’t true. Not all skin conditions are cosmetic – they can be a symptom of a larger health issue, or cause trouble down the line. Taking care of your body doesn’t make you less manly – it makes you smart. Varicose Veins are enlarged and swollen veins typically found in the legs. These lumpy and bulging veins are damaged and weakened valves. These weakened valves cause blood to stop flowing productively through the veins and instead cause blood to reverse and pool back into the vein, causing dark blue or purple colouring in the leg. 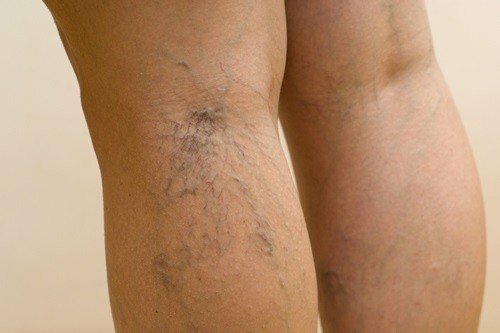 Varicose veins are not only unsightly, they can be harmful and cause circulatory problems as well as pain and swelling in the legs. Many men (and women as well) consider varicose veins to be something that only strikes elderly ladies and causes a person to have to wear uncomfortable compression hose to prevent them. While this is a common punch line, it’s not an accurate one. Even young, healthy men can develop varicose veins and all of the symptoms that come along with them. If you spend long hours sitting in front of a computer, whether it is at home or at work, you are more susceptible to developing varicose veins. Sitting for an extended period of time causes blood to pool in the legs and makes developing varicose veins more likely. In addition, high sodium food are more likely to cause varicose veins over time. So if you have a habit of eating frozen pizza while spending a long night in front of the computer working or playing video games – you’re at risk. There are many ways to take preventative measures against varicose veins that are fairly easy. The main one is to maintain a healthy diet and exercise. By ensuring that you are taking proper breaks during long periods of sitting to get up and take a short walk can do wonders. In addition, ensuring that your body stays hydrated and you are eating proper meals can go a long way. Spring is officially upon us, and after that comes summer and shorts season. Take care of your body so that you can enjoy all that Kelowna summers have to offer, and take strides to maintain a healthy body and lifestyle. If you have any questions regarding preventing varicose veins, or treating already active varicose veins, please give us a call – we’re happy to help.